indian scientists have developed the country's first infra-red probe to measure snow surface temperature. The probe, designed by the Central Scientific Instruments Organisation (csio) in Chandigarh, assumes importance in the wake of growing criticism that India lacks state-of-the-art instruments to study the effects of climate change. This is the first in a series of new instruments from Indian laboratories. The new probe, capable of operating round-the-clock in harsh weather conditions in snow bound areas, can withstand temperatures between -40c and 50c and wind speeds up to 200 km per hour. csio scientist M A Shamshi says the instrument set up in the Siachen region of Jammu and Kashmir and at some points in Himachal Pradesh, has started transmitting data via satellite on an hourly basis to the Snow and Avalanche Study Establishment (sase) in Chandigarh. "It works on the simple principle that all objects emit infra-red radiation generated by the vibrations and rotations of atoms and molecules within the matter. As temperature increases, molecular activity increases and the object generates more energy," he explains. The probe's main component is the detector, which converts radiant energy into electrical energy that is read by a processor and displayed on a lcd screen. The final output of the probe is in volts and frequency to make it compatible with most snow data recording systems. The team reported their work in the Journal of Scientific and Industrial Research (May 2007). Shamsi says temperature sensing probes were earlier imported from countries like Finland and Switzerland. Indigenous manufacture will slash the cost of the equipment by a third and make monitoring a cheaper option. sase, a unit of Defence Research and Development Organisation (drdo), which has sole access to most areas of the Himalayan range, will now cut down dependence upon foreign players in this strategically important region. 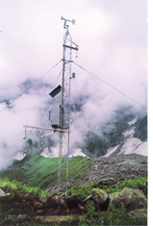 sase joint director A Ganju says drdo will install about 50 weather stations to monitor various snow parameters in the western Himalayas over the next five years. The first inferences on rate of glacial melt can be drawn after five years since conclusive evidence comes only from a long-term study. sase scientist R K Garg says two more instruments will be put up in the Himalayas by August--a multi-parameter probe to measure hardness profile and snow temperature, and a moisture meter. "We will have field trials this winter. Snow hardness will be measured for every five mm to generate a profile of all the snow caps," he said. Wide use of indigenous instruments will help accumulate data from various points rather than just a few regions, according to B R Arora, director of Wadia Institute of Himalayan Geology, Dehradun. "As of now, the data generated at Dokriani glacier and Gangotri is used to represent the entire Himalayas. But it is wrong to generalise the whole range on the basis of readings from just a few stations."